JBL 4312SE speakers celebrates the brand's 70th anniversary | What Hi-Fi? JBL is celebrating its 70th anniversary with a new bookshelf speaker that wears its heritage on its sleeve. A 70th anniversary is a biggie, and JBL has decided to celebrate it in style. It's launched a new loudspeaker called the 4312SE, and while it might draw on the brand's heritage, it aims to deliver a sonic experience that's bang up to date. It's a direct descendant of the JBL 4310/4311 speakers, and retains the 12in three-way design that became so popular in the 1970s. 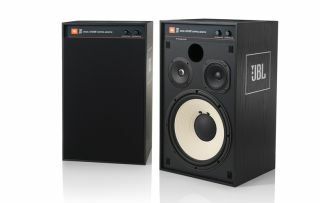 JBL promises powerful bass and dynamic highs, even at the highest listening levels. It's adaptable, too. You can position each speaker horizontally or vertically, with the tweeters on the inside or outside of the listening position. You can also shelf- or stand-mount them. Each speaker features a special 70th anniversary badge, and each also comes with a certificate that includes the serial numbers and signatures of the people who designed and built the system. You also get frequency trim controls, a bass-reflex enclosure with front-firing port, binding-post speaker terminals and a black wood grain finish with removable black cloth grille. They're set to cost £2300 a pair and hit retailers (in limited quantities) in April.